Drilling out gun barrels is easy to do as long as you take your time and are careful. If you mess up, it's a big pain to try and fix, so it's worth going nice and slow. You only need a couple things to pull this little trick off. 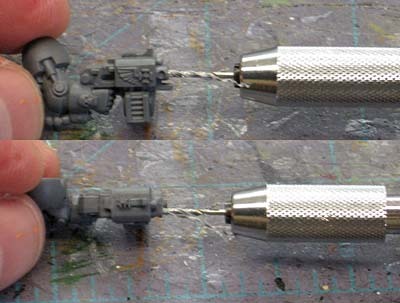 Pin drill (I'm a fanboy and use the GW version). Fine point marker or felt tip pen. 1. Clean the mold lines from the face of your barrel. 2. Place a dot where you want to drill each barrel. 3. 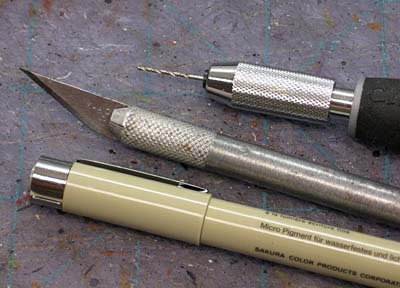 Use the X-Acto blade to make a small pilot hole in the plastic. It doesn't have to be a deep hole, just enough that the pin drill won't skip around when you start drilling. 4. Use the pin drill and drill out the barrel. From Alex: You can't emphasize step 3 enough, especially if you have an electric Dremmel tool. From GDMNW: I'd add that when you start drilling you should stop as soon as the drill has bitten to see if your mark really was in the centre or not. If it's to one side then you can rescue the gun by drilling a small pilot hole in the real centre and starting over. From SC John: Use a dental pick or push pin type thumb tack to make the guide hole, as they are round. Once you're done, if you've got any excess in the barrel opening, you can always go back with your X-Acto blade and clean it out. Just be careful not alter the shape or size of the barrel opening. 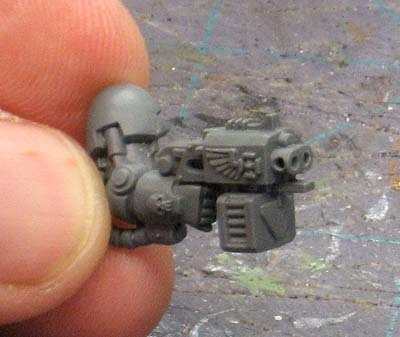 This works the same for larger guns like multimelts and heavy bolters. I just end up using a larger drill bit after starting out with the normal GW one. It in effect becomes a second pilot hole so the the bigger drill bit doesn't move around on me. When drilling, make sure you're drilling on the correct axis. Meaning your in line with the gun horizontally and vertically. You don't want to end up drilling a hole out the side of your gun in your zealous attempt to make it look cool. And then you can go all out and drill the side openings in the barrels too. That makes it super real. If you happen to make a mistake and damage your barrel in the process of drilling it out, don't worry, here's how you can fix it. I've done this with my Ork army and it's a great effect. I actually get a little bummed when I see an well painted army that doesn't have the gun barrels drilled out. Also, you can't emphasize step 3 enough, especially if you have an electric Dremmel tool. Gun barrel drilling is where it's at. I'd add that when you start drilling you should stop as soon as the drill has bitten to see if your mark really was in the centre or not. If it's to one side then you can rescue the gun by drilling a small pilot hole in the real centre and starting over. You can't do that if you have already drilled your barrel out completely. This goes double for metal gun barrels. Excellent stuff guys, thanks. I went through and add your suggestions into the post. I use a dental pick or push pin type thumb tack to make the guide hole, as they are round. Ron, are you doing this to all your Deathwing yet? Fantastic post. It's so frustrating as I've been drilling out the barrels for a couple of months without really paying much attention to what I'm doing. I'd just dive straight in with the hobby drill and hope for the best. My army, needless to say, has some very unusual gun barrels at the moment. I'll definitely be following your lead in future. Darren: Glad it helps, it might seem like overkill, but I think it's worth taking the extra steps to make them look right and save yourself the pain. SC John: Unfortunately no, my Deathwing are not done to this basic standard. The suffer from "black dot barrel" syndrome. I can't be bothered to do this to my own army. Who has this kind of free time? I'm curious about what size bit you use, and what made you decide on that size? the other Kevin: I use the standard GW sized bit. Whatever came in the package with the drill. As for the actual size, I don't know what it is.